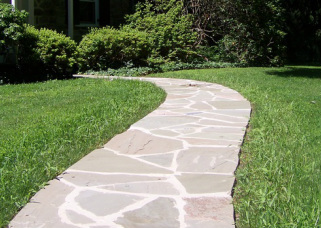 Increase your home's value with hardscaping form Clark Kent Creations. A professionally installed hardscape not only provides beautiful space for outdoor living, but is also a key component of an effective drainage and landscape management plan. Clark Kent Creations LLC offers a full range of hardscaping services and installations to help you maximize your outdoor living space. 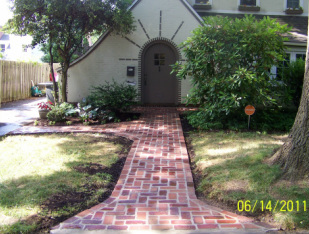 Whether you’re thinking about manmade paver stones (most major manufacturers available), clay bricks, natural flagstone, or concrete; whether you're looking for a small intimate garden space, a large space for entertaining, or a simple pathway, we have the knowledge and experience to help turn your dreams into reality. We'll work with you to come up with a design that works for you and choose the materials that best suit your needs and desires. Dry Set or Wet Set? A brief terminology lesson. 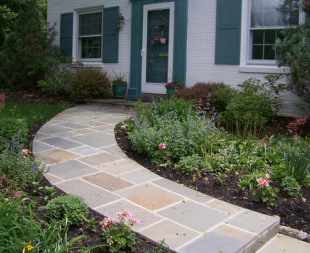 Hardscaping projects generally fall into one of two basic categories; Wet Set or Dry Set. While there are a lot of options to consider when selecting materials, no matter what material you choose they will be set using one of these two techniques. Wet Set refers to setting the materials in a bed of mortar. We start by installing a solid 4" thick concrete pad, and setting the materials in Type S mortar directly atop the pad. See "The Process" link here on the website. It is a solid impermeable technique that is rigid and strong. Dry Set refers to setting the materials atop a bed of compacted crushed gravel and sand. It is somewhat more flexible than a wet set technique, offers some permeability, can be lifted and reset or repaired more easily than wet set, and is somewhat less expensive. It is also slightly more prone to frost heaves or erosion over time. Both techniques have pro's and con's, and one may or may not be better suited to certain sites or situations. We'll be happy to discuss what technique is for your site if you're interested.